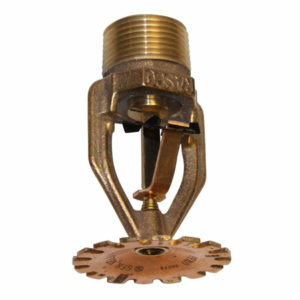 The Reliable VELO–ECOH Extended Coverage Sprinkler has a very extra large orifice with a nominal K=14 (200). It can provide Ordinary Hazard protection to 37,2m2 at lower pressures than an XLO which has a nominal K=11.2 (160). VELO sprinklers are standard response and are available in a pendent or an attractive recessed pendent type which provides up to ¾” (19mm) of escutcheon adjustment. Various finishes are available. Reliable VELO–ECOH sprinklers provide protection in Ordinary Hazard Group 1 and 2 Occupancies to 37,2m2 per sprinkler when the system is designed to NFPA 13 hydraulic density requirements. ECOH pendent and recessed pendent sprinklers are to be installed according to the design criteria shown in this bulletin. The use of ECOH sprinklers can provide lower system installation costs by requiring fewer sprinklers, less piping and reduced labor. Model GFR VELO sprinklers use a levered fusible alloy solder link. Provides Extended Coverage Ordinary Hazard protection to 37.2m2 per sprinkler. Very extra large orifice of nominal K =14 (200) permits low pressures. Available in pendent or recessed pendent styles. Recessed pendent version provides ¾” (19mm) adjustment to flush pendent position. 100°C or 74°C temperature rating. Available in brass, chrome, black plated and polyester coated finishes. Can be used for all editions of NFPA 13.